Dan has been in the HVAC industry for 23 years with experience ranging from installation and service to sales and distribution. 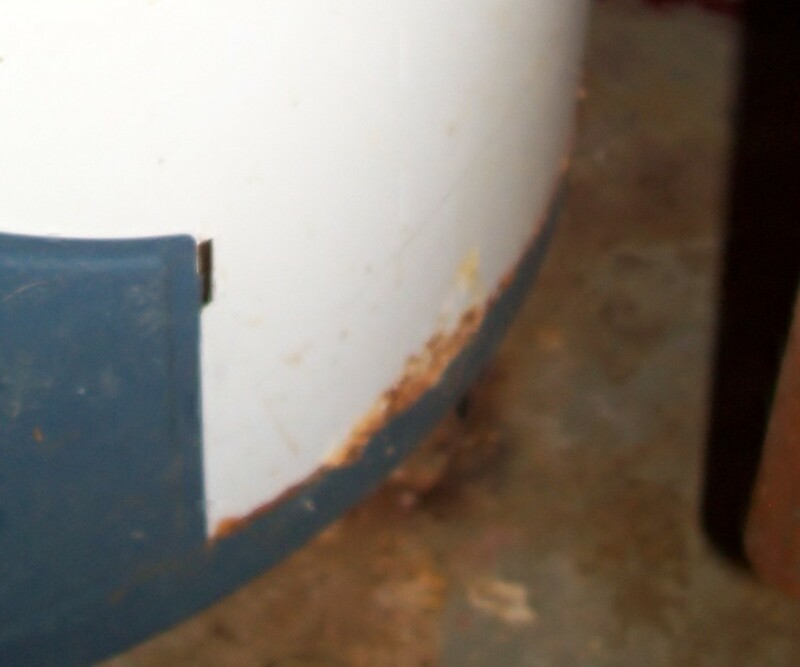 The hot water tank is likely one of, if not the most, neglected household appliances there are. This is funny because it is arguably the most used appliance in our home. 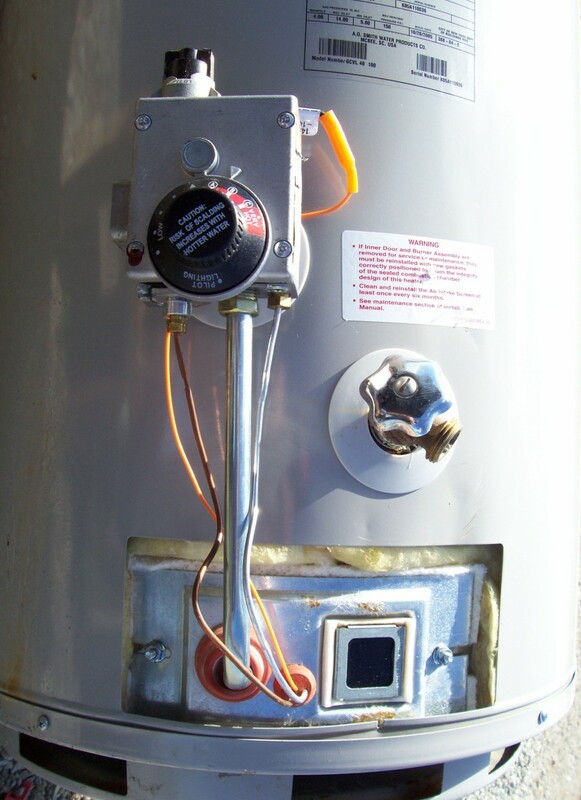 Luckily, the task of maintaining your water heater is rather simple, it's only required about once a year and it'll actually pay you back by increasing your water heater's lifespan. Not to mention you'll also have cleaner water. With all that our hot water tank does for us, don't you think it's time to show it a little love? 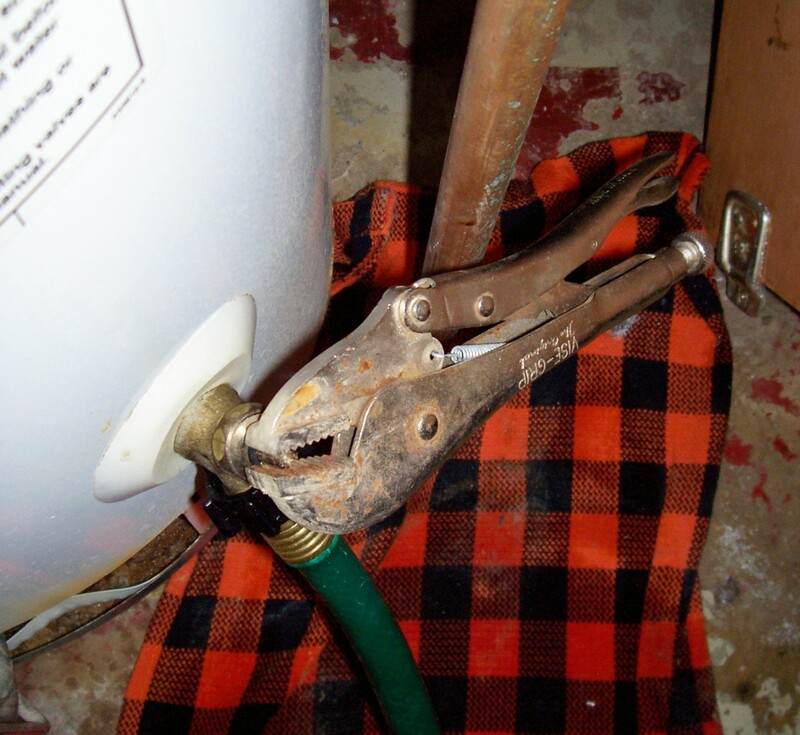 This article is going to make it simple for you to perform this routine maintenance as quickly and easily as possible while still being thorough and without the need to completely disconnect your water heater. Though the overall task can take an hour, or two if it hasn't been done in a while, much of this is downtime and will allow you to do other things at the same time. You probably have everything you need right there in the house—so let's get started! Hopefully you won't even need the hand tools. Garden Hose: The distance from your water heater to where you'll be draining will determine how long the hose will need to be. I prefer to use this expandable hose to drain my water heater. It's 50 foot long, collapsible, and this version has a shut-off valve at the end making it easy to keep this project mess free. 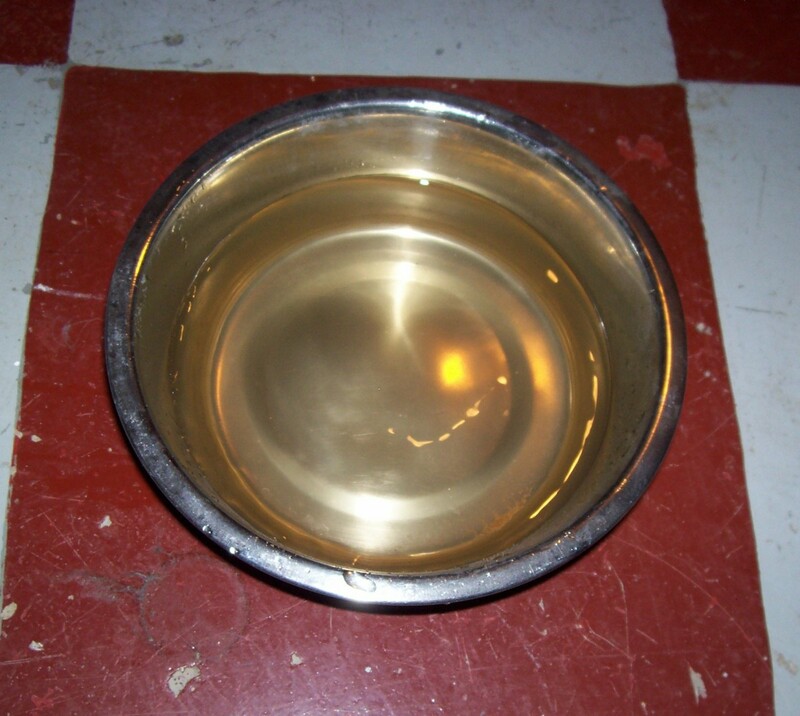 Pan: I suggest a stainless steel mixing bowl so that you can get a "clear" picture of what your water looks like. Old Towel: We're working with water here and we're probably going to get a little bit dirty. This is good to wipe your hands or clean up small drips or messes. 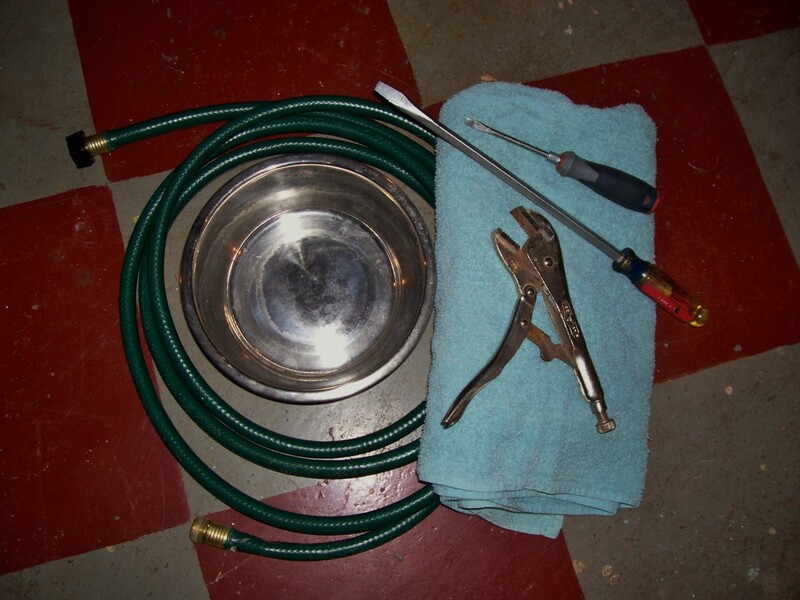 Vice-Grips or Flathead Screwdriver: These may be handy if you don't have a handle on the drain valve of your tank. Most of you do but since I'm not so lucky, I thought I'd mention it. 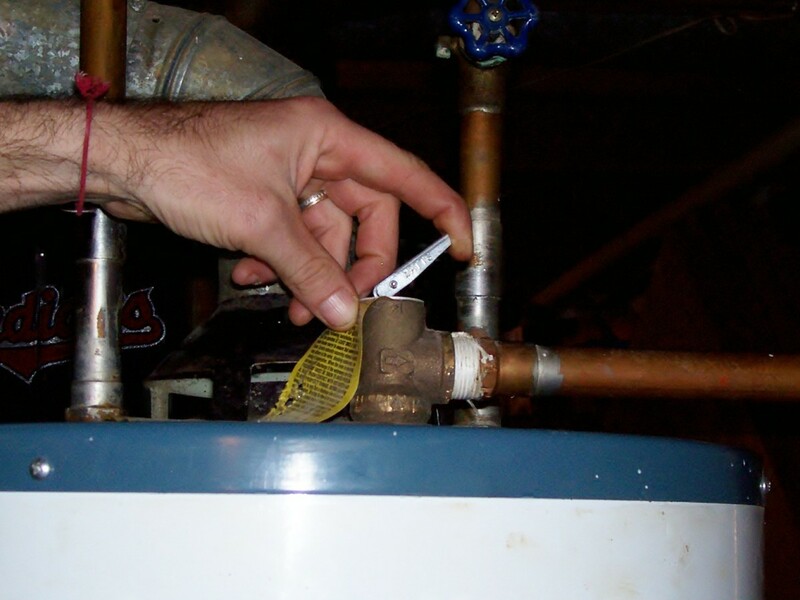 The first thing you'll want to do is check your temperature and pressure relief valve. (T&P) This is because if your T&P is bad, you'll want to go ahead and change it at the same time that you drain your tank if possible. 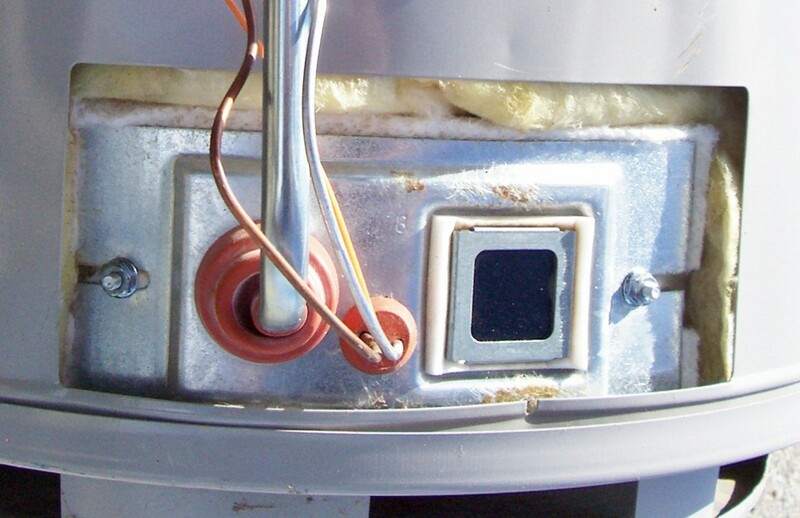 This is the Temperature and Pressure Valve (T&P), usually located on the top of a hot water heater. The specification tag on top of the T&P valve contains the necessary information to help you find the proper replacement part. Place your pan under this line so that it can catch any water that comes out. Slightly lift the lever on top of the valve (opening it all the way is not necessary) so that you can hear it hiss and produce a small amount of water from the discharge line. Once you hear and see what you're looking for, shut the valve back down and we can get started draining the tank. If not, you'll want to stop now so that you can just drain the tank and make the repair at the same time. To obtain a proper T&P replacement part, use the information provided on the rating tag mounted to the top of your valve. You should be able to find a suitable replacement from a local hardware or home improvement store. Make sure you have everything else you need to replace your T&P valve as well so you can get it all while you're there. This is one of the most popular T&P valves, and it works in most applications (confirm that it'll work in your application before ordering). I install these all the time. They work well and are equal to, or better than, most original valves. The temperature control is the large dial in the front of this component. The burner control is on top. Notice the notch in the knob and the indicator stamped in the steel at "12 o'clock. It is now in the "on" position. Now the burner control is set to pilot. 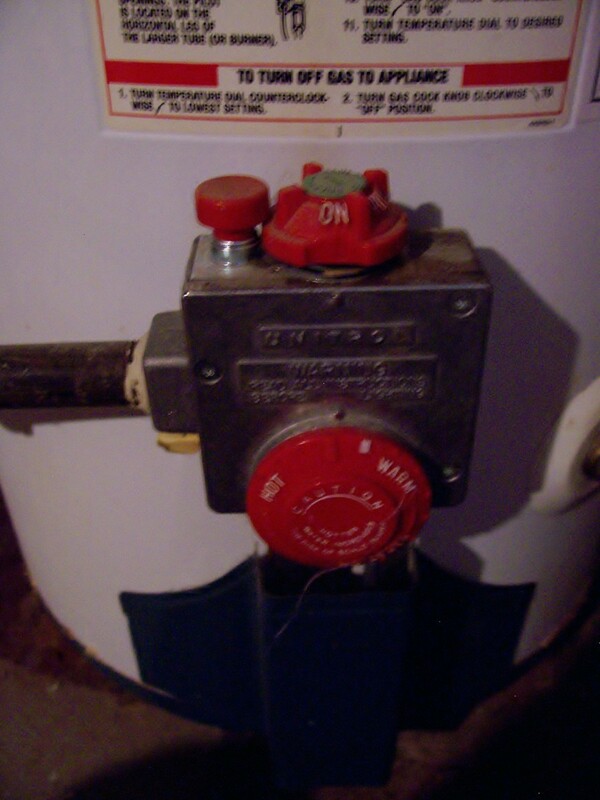 On a more modern water heater, the controls may look a bit different like these but the concept of turning it to "pilot" is the same. The biggest difference here is that there is no separate pilot button. The button is the control knob. The breaker panel shoud have a dedicated breaker for your electric water tank. This is your drain valve and where you'll hook your hose. I am draining into my sump crock. Where will you drain? Luckily, I have a cold water shut off right above my water tank. This is what your water main valve assembly might look like. Luckily, you have a handle on your drain valve. 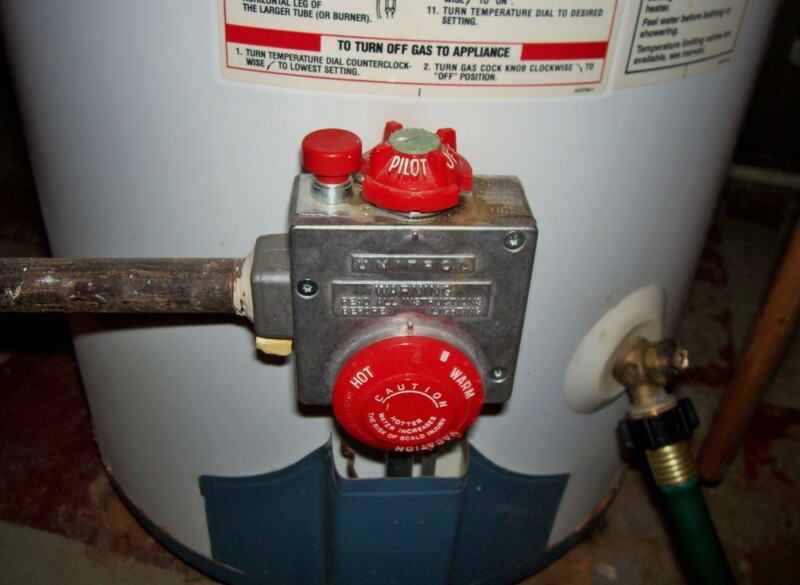 If you have a gas hot water heater, turn the burner control knob to pilot. Push down a bit on the control so that it will turn. There should be an indicator on the face below the knob to confirm your selection. You should notice that the knob is notched out. If this notch is positioned so that the red pilot button can be pushed down, you're in the right spot. For newer gas water heaters, the concept is the same with a slightly different knob style. 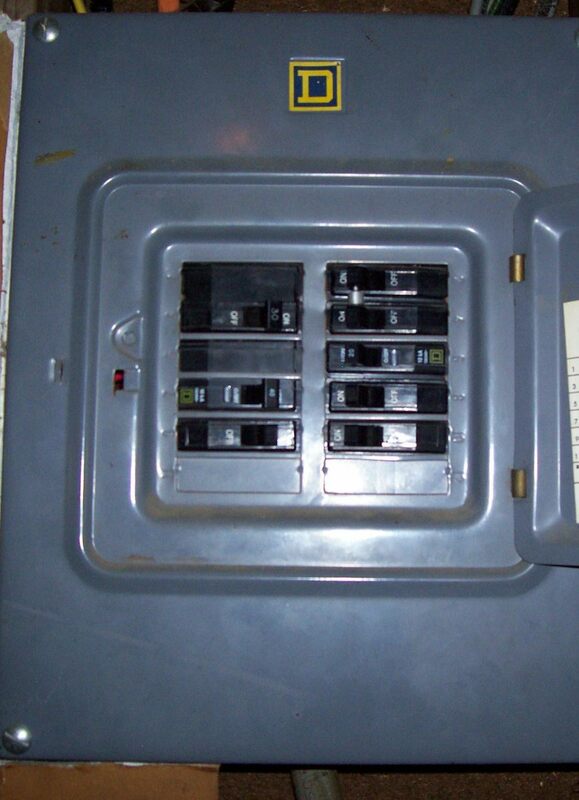 If you have an electric water tank, turn the breaker supplying power to it "off" at the electrical panel. Go get your hose ready. We want to let the water tank cool so that we aren't working with the extremely hot water is now contains. To speed up this process, on the way to get your hose, turn on the hot water side of your kitchen sink. Since our burner is off, this will help rid you of some of that hot water while replacing it in the tank with cool water. Leave this faucet on as it is going to help us prevent vacuuming in the lines in a little bit. 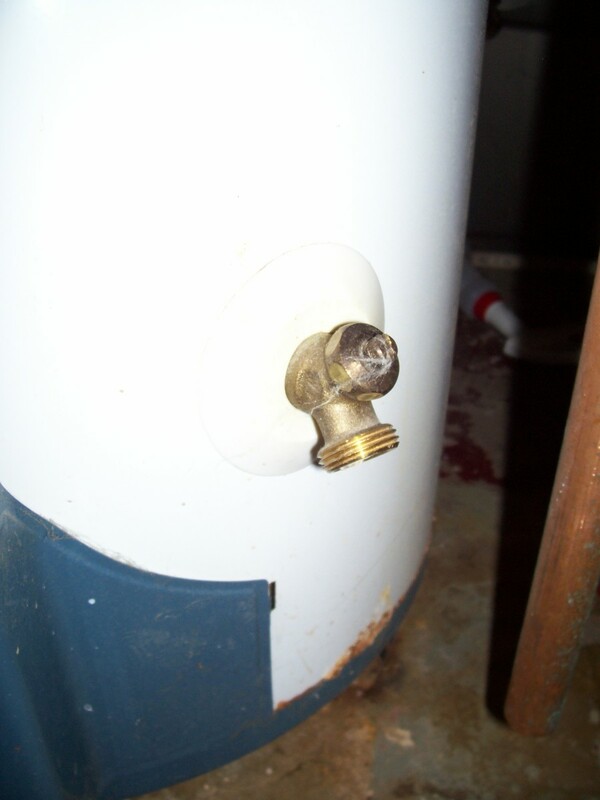 Now, hook your hose to the drain valve on the water heater and route it to it's drainage point. 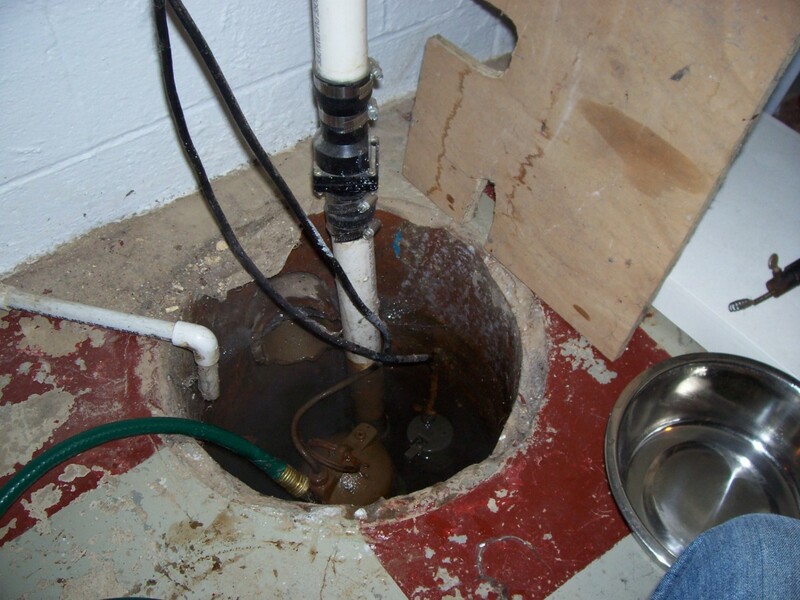 This can be a sump pump well, a floor drain, a clean out...anywhere that will carry the water to the sewer or street should be fine. Open the drainage valve on the tank. Depending on how long of a hose you had to run, you should see water discharging pretty quick. If not, you may have a kink or vacuum in the hose itself. Going along the hose and giving it a wiggle and lift here and there can help "burp" the line if need be. Also, here is where the hot water faucet being open is helping us again. You did leave it on right? One of the kids didn't go shut it off unknowingly did they? Good. Then once you've confirmed the tank is draining proceed to the next step. Wait.... No, you didn't mess up. That's the next step. We wait for the tank to drain. 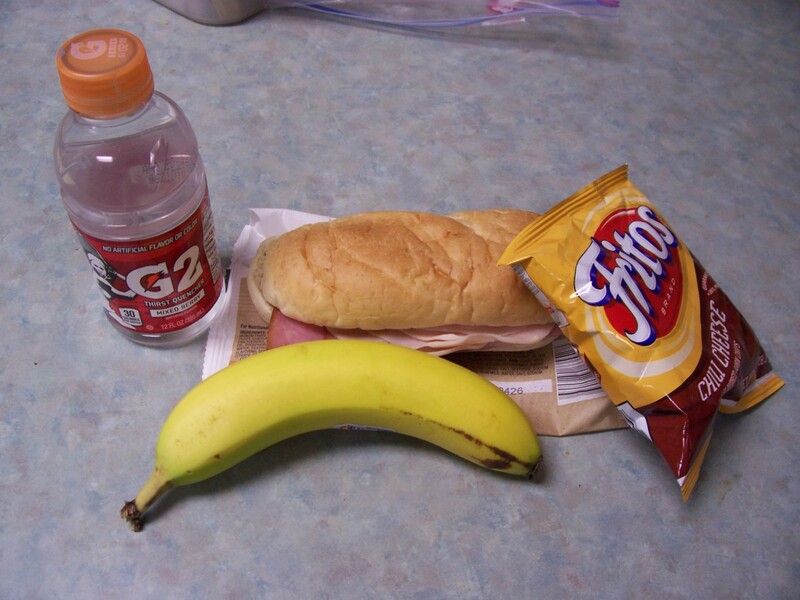 Now might be a good time to check on the game, make a sandwich or grab an ice cold beverage...from the fridge...since some of you don't have cold water right now. Do you still have some time to kill? Then let me educate you while we wait. When is the last time you drained your water tank? You're supposed to drain that thing? While we''re waiting, let's talk about why we're doing what we're doing. Our water is not nearly as clean as we'd like to think and over time, all kinds of little things in our water will accumulate at the bottom of the tank. In addition to what's in our water, the tank itself does corrode and releases bits of this corrosion into the water to join the rest of our deposits at the bottom. This deposit build-up is good to help speed up corrosion in our tank as well. Now, not only does this water sound less than desirable to bathe in, try boiling a pot of water, then, try boiling a pot of water with some dirt in the bottom. Which one boils faster? 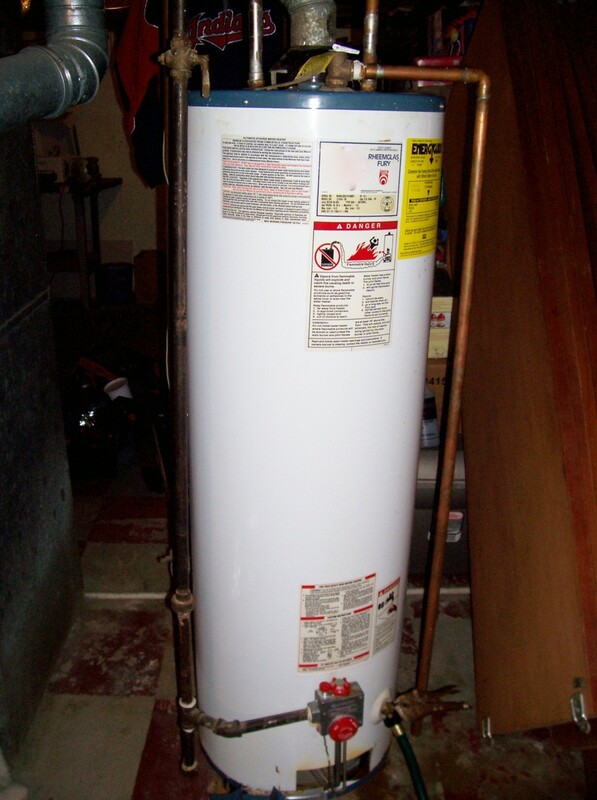 The longer it takes our water heater to reach its' desired temperature, the more it costs you to run it. 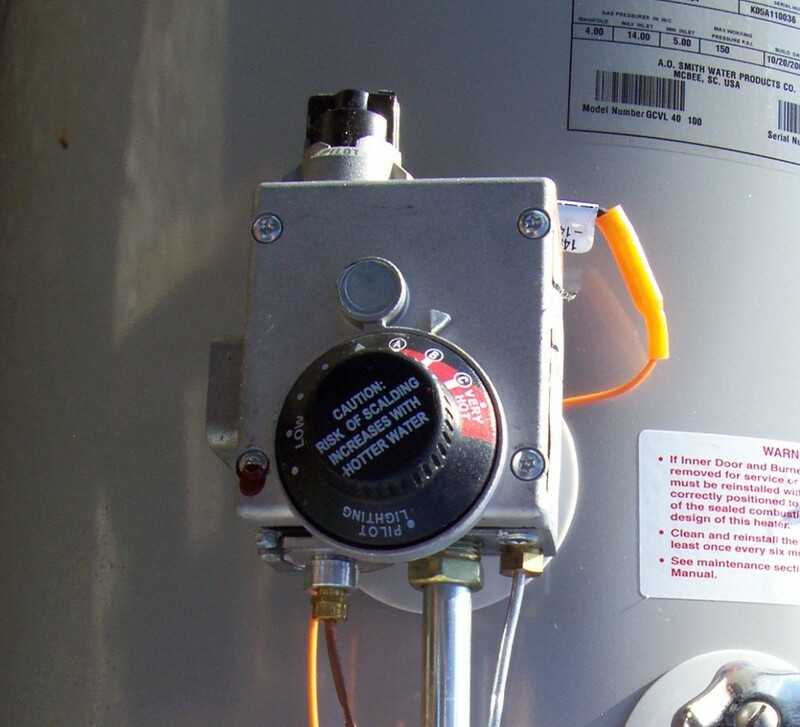 Cleaner water, lower utilities and a longer lifespan for our water heater all sound good to me. How about you? Looks like someone had better start saving for a new water tank. This is also a good time to inspect your water tank. You've already checked your T&P valve and we know that the drain valve and burner controls are working. What about the body of the tank? Take a good look over the body of the water tank; particularly the bottom. Do you see any "blisters" where it looks as though it's beginning to rust? Is there any water dripping from anywhere or wet spots underneath that may be signs of your tank leaking? If so, you may want to begin preparations for getting a new tank. When the tank finally goes, it can be messy, inconvenient and even cost more if you have to pay for emergency service or don't have time to shop around. "Foilback" insulation is one type of insulation that can be used though the "R" factor is a little lower than some others. Lastly, feel the water tank. Is it fairly warm to the touch? If so, you may want to consider wrapping the tank in a blanket of insulation. 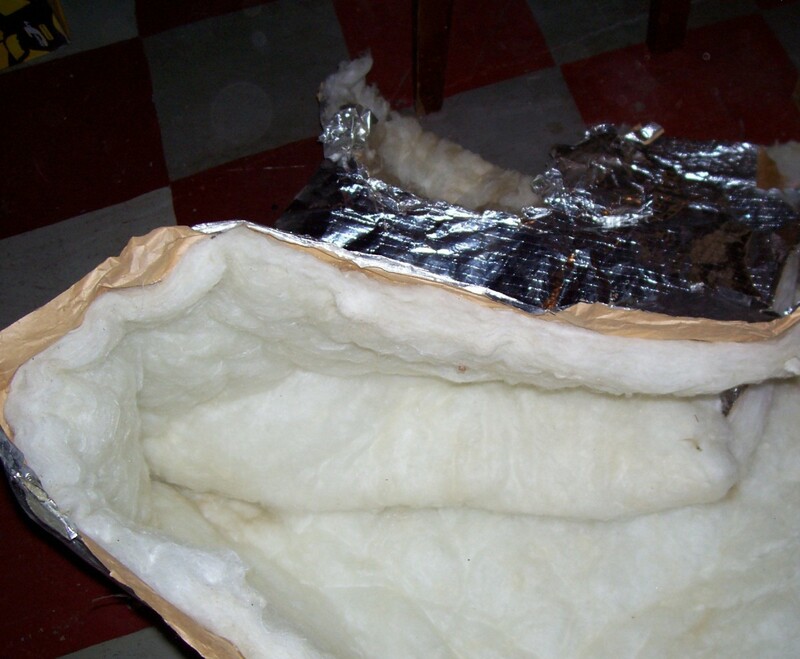 There are a few different kinds of insulation that can be used and they even sell fabricated "blankets" that you can buy at the local hardware store. Ask the store what they have in the R-5 to R-8 range as far as insulation rating is concerned. This blanket can help to maintain the tank's water temperature during standby and again, save you money. Don't wrap the tank airtight. Let it breathe a little and cut around the burner access and controls that can be dangerous or you may need to use. What do you think your water might look like? So it seems our tank is empty. The water has stopped (or nearly stopped) draining. Now it's time to flush our tank. Depending on how long it's been since you last did this and what you see coming out into your bowl, you may have to do this a few times. If it's pretty bad this time, you'll know why you should drain the tank on a yearly basis and next time won't likely take you as long. Open the cold water valve. Let the cold water run into the tank for about 15 - 20 seconds and then shut it back off. This will stir up any left over sediment in the bottom of our tank. 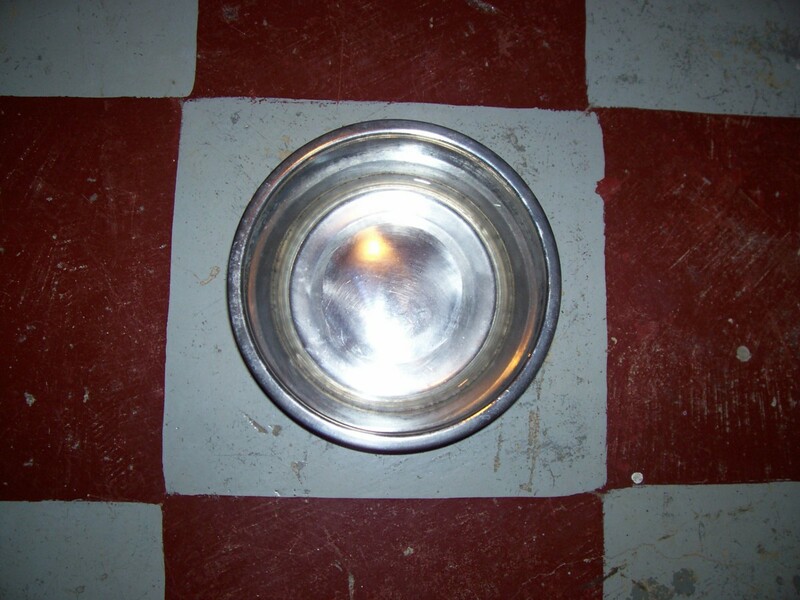 Go to where your hose is draining with your bowl and take a sample of what is coming out. 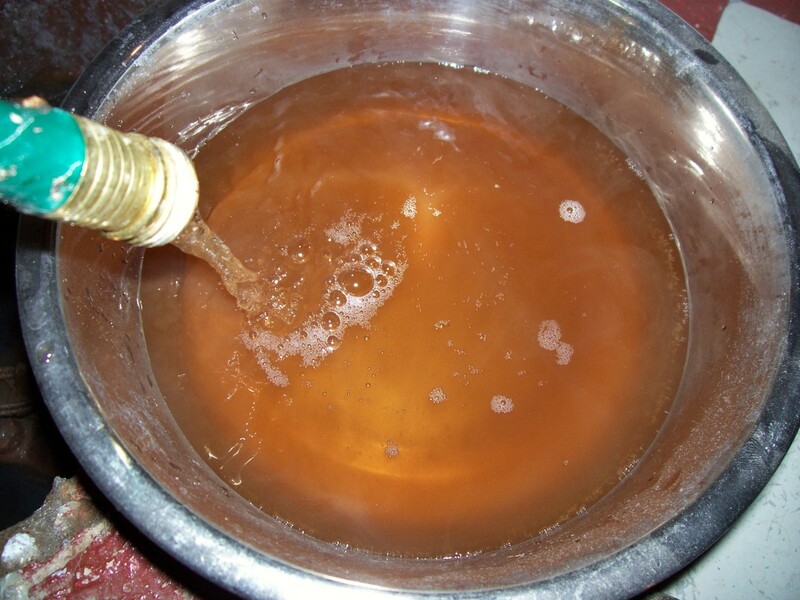 If the water is dirty, you will want to let it drain and repeat the flushing process until you are satisfied with what is coming out in your sample. If the water is clean, we're ready to wrap up and get on with our day. Shut off the drain valve. Now that the water is clean we can shut off the drain valve, turn on the cold water, disconnect our hose and let the tank begin to refill. Open up the hot water faucets in the house. We have probably gotten some air in the water lines while we drained out the tank. By opening all the hot water faucets in the house, we can quickly "bleed" the air out through the faucets. Once all the faucets have a steady stream and pressure, you can shut them off. There is no need to do this to the cold water lines. Turn the burner control back to the on position. You don't want to do this until the tank is at least half full. Turning on the heat too soon can cause damage in some cases. The burner should kick back on immediately since the water is cold. For those of you with electric water heaters, just turn your breaker back on. You should be able to feel a noticeable rise in temperature at the faucets within the next half an hour. This blue panel is protecting the burner assembly. The 2 pieces slide in and out rather easily for you to access the pilot light and thermocouple. There it is, our pilot light. We're in good shape. Here you can see the sealed combustion chamber door that more modern furnaces have. Notice how it's bolted on and that there is a spyglass for you to view the pilot. Did your pilot go out? Is your water not heating up? It's possible during this process the pilot was shut down by accident. 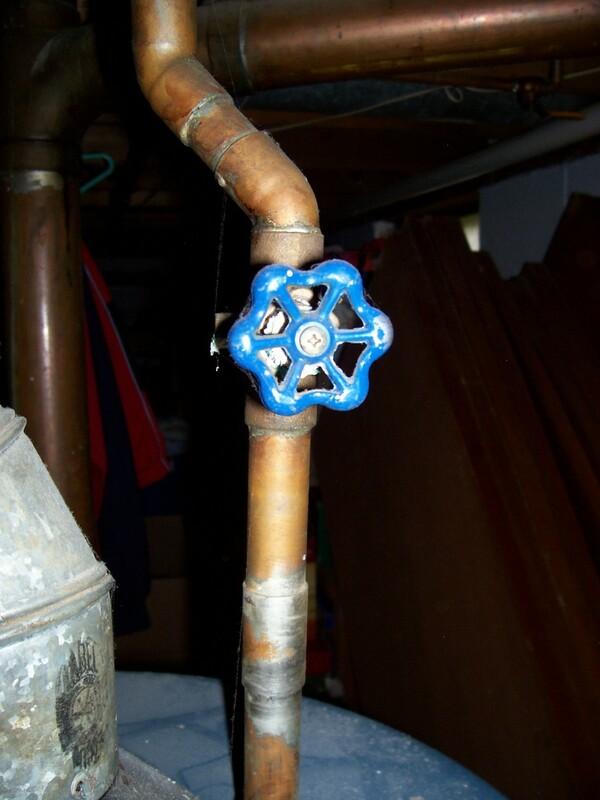 Before you call a plumber, check the pilot first to see if you need to relight it. 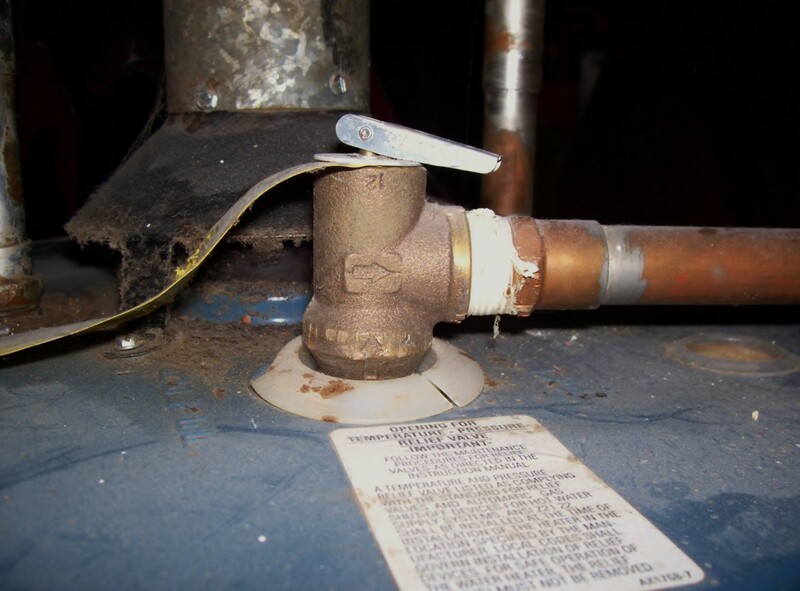 If you have an easy to remove (slip on) metal cover protecting the burner assembly of your gas hot water heater, remove it and the silver shield behind it. Both should come off fairly easily. 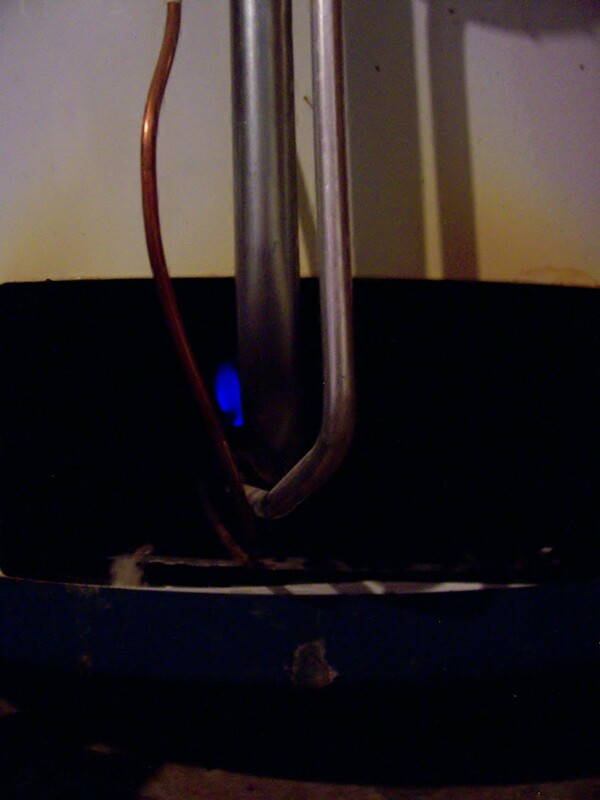 Look into the burner chamber to confirm whether the pilot is lit or not. 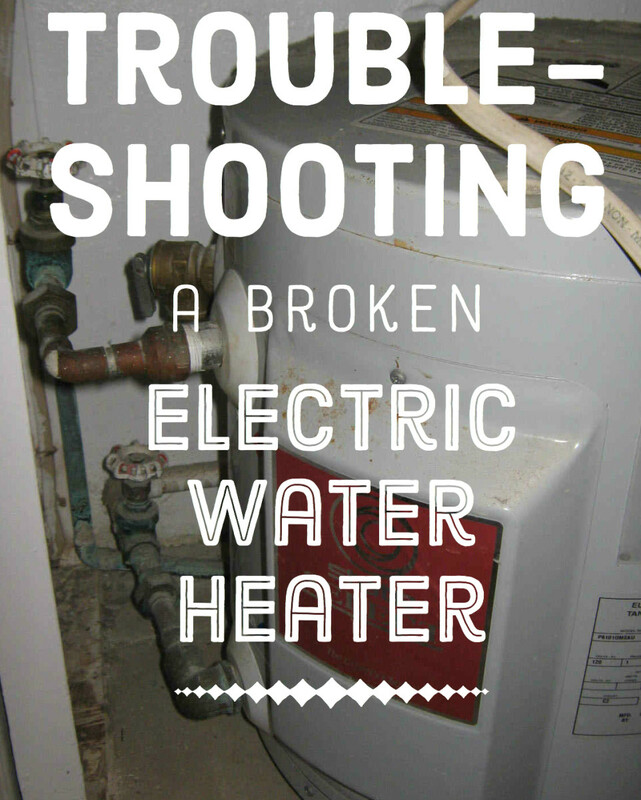 If your water heater has a sealed combustion burner assembly, do not attempt to open it up. There should be a sight glass for you to peek into the burner compartment without opening the seal. You too may need to relight the pilot but will have a slightly different method of doing so. NOTE: If you run into a situation that is not described in this article, please do not assume. Look for further information or contact a licensed plumber. 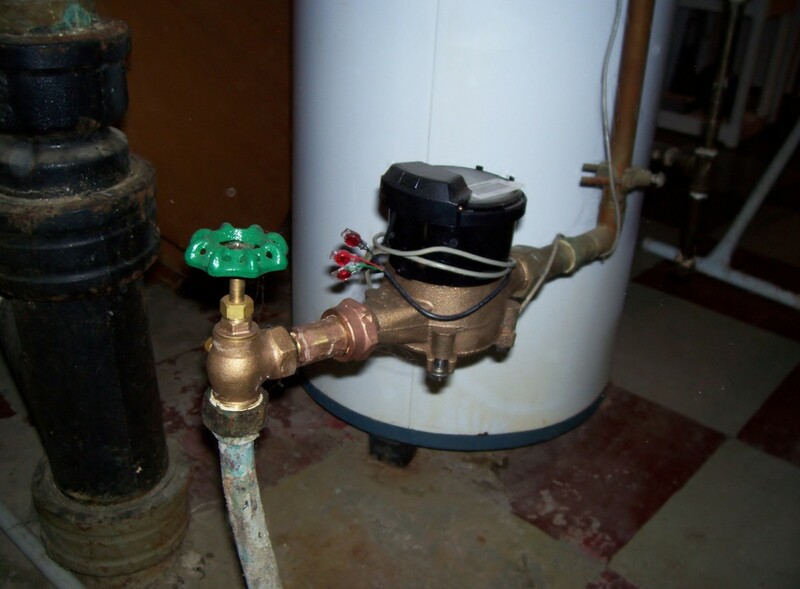 Not all tasks involving water heaters are do-it-yourself projects and require a professional. Draining your water tank is a rather tank-less, I mean, thankless job. While it's not likely you'll get a whole lot of "hoorays" and high fives from the family, go ahead and give yourself a pat on the back. The job you've just done has made a difference and even though you can't show it off to the neighbors, you can feel good that it's done and know that next time, it will be all that much easier. 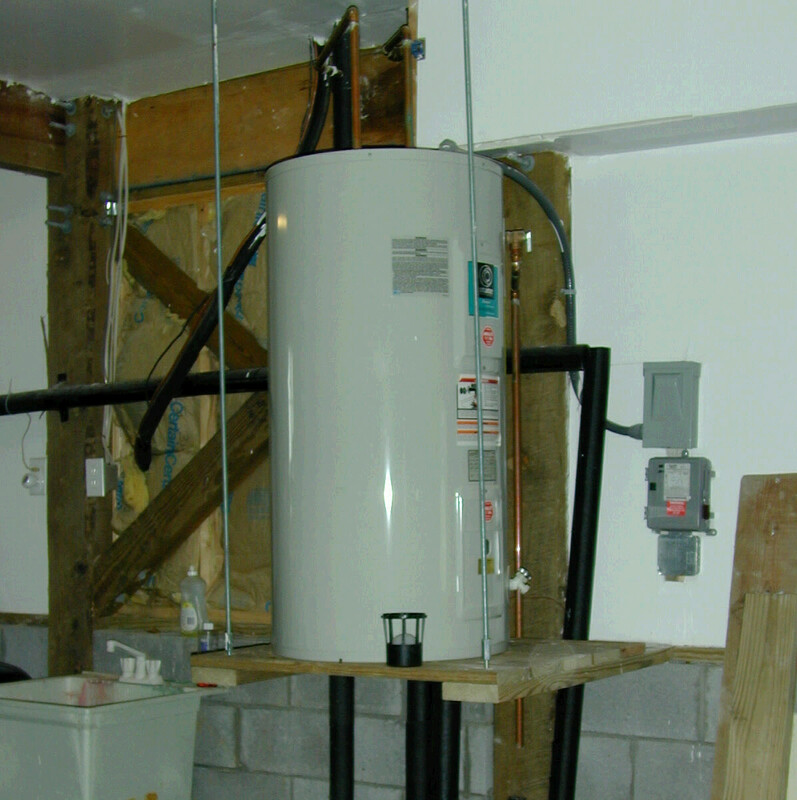 How long would it take to drain a 50 gallon water heater? That depends a lot on how much corrosion or mineral build up gets caught in the drain valve. If clear, maybe 10-15 minutes. 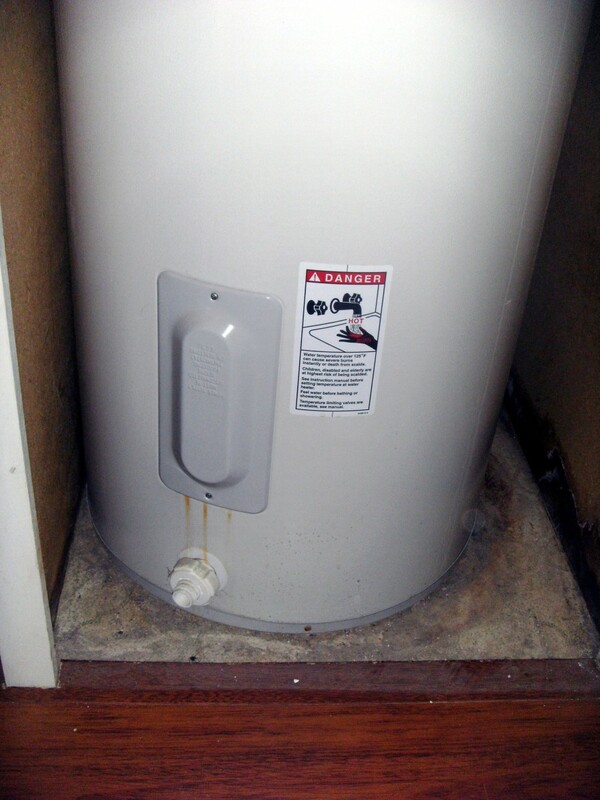 How much water should drain out of a water heater with a 50 gallon tank? 50 gallons unless you don't shut the incoming valve off. Then it would just continue to drain. If I have two electric water heaters hooked up in series, is the process the same except that I need to drain both of them separately? It would depend on in what order the one is you’d pull out and if there are isolation valves inline. I can't drain my gas hot water tank using a hose because of the distance uphill to drain it. Will the tank empty if I only turn on the hot water faucet? If you get the water going, you'll be surprised how uphill the pressure can push the water. Maybe not all the way, but most will likely still drain. As for the faucets, yes, that would be fine, but if you do and cut the lines, a lot of water will be left on the cold side and perhaps dump on you when you cut so be ready with a bucket or perhaps a push fitting ball valve to stop the flow. 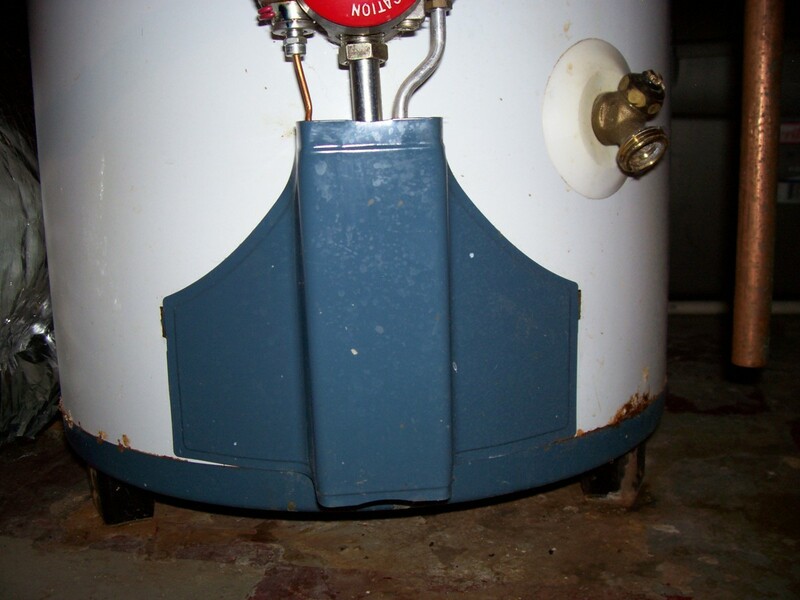 My water heater just went out right before thanksgiving and I honestly didn't know that you had to drain it lol, give me a break new homeowner, but did almost the same steps as you listed great article very informational! Voted up! Great hub! It really is important to drain the heater. It will stop all kind of problems especially if you live in a hard water area. 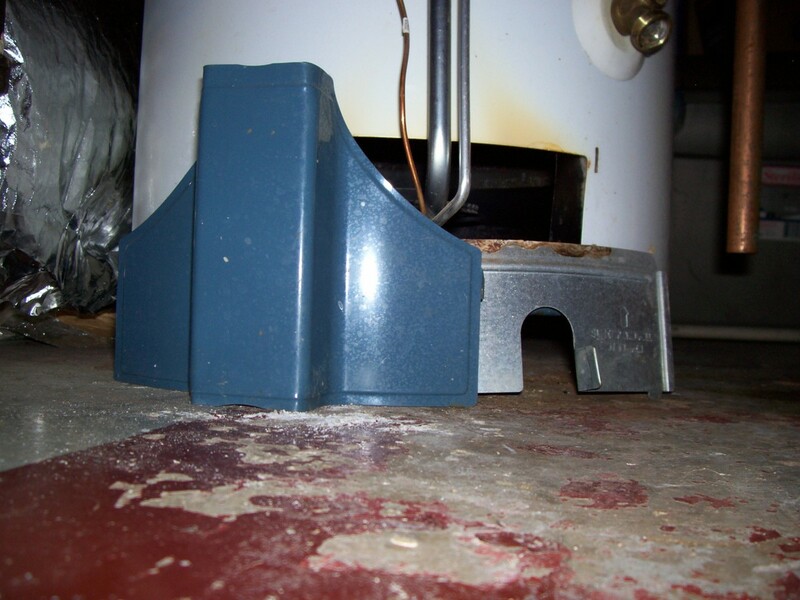 I remember inspecting one heater and due to them not draining it for over 5 years the water really smelled terrible! These kind of incidents are not as rare as you think - so follow these instructions and enjoy the extra years you have given your heater! We definitely don't drain our water heater every year. We probably need to start. A man's gotta eat, right? LOL. Jobs like these aren't typically "fun" but with the right mindset...well it's still not fun but I do hope to add a chuckle here and there to lighten the load. Thanks TW! Thanks Robie! I really appreciate your compliments. Wow, cre8or, this is a wonderful hub!!! You are a real professional and yet a great writer. You have explained everything so well, that even I could do it, but hey I guess it's not my job :D Congratulations, you rock!!! Absolutely. Better use, cleaner water, free of charge....what's better than that. Thanks summerberrie and your welcome. better use. Thanks for the valuable information. 7 years ago from Bedfordshire, England. Excellently clear and precise instructions. Voted up and shared. Good job, Big C.
Great information...voted up and useful! These instructions are so easy to follow, I might not even have to call my dad for help. Great information! Thanks Amy, habee. I'm glad they are easy to understand and yes, the water picks should have more than a few wanting to do this. This is a great hub with handy, clear instructions. The pictures especially make me want to go drain mine right now! I also like that you included a note to contact someone if you encounter a different situation. Voted up! Useful, easy-to-follow instructions. 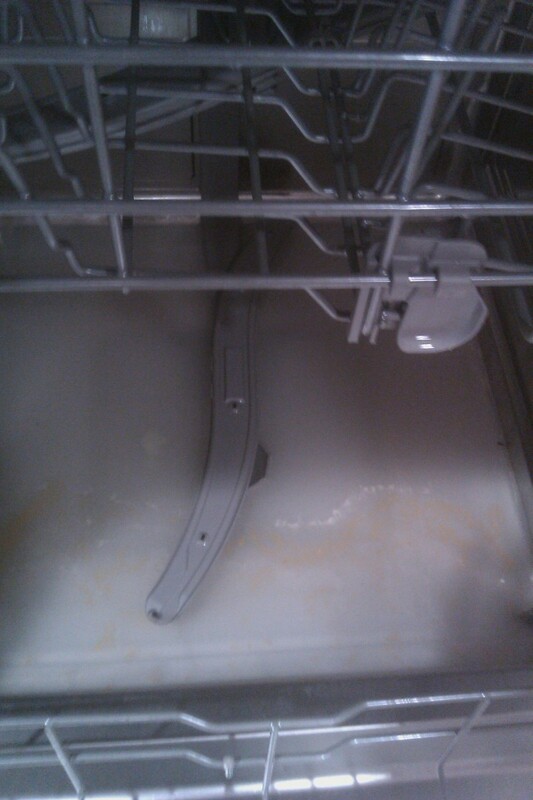 Thank goodness, hubby is super handy around the house. Voted up!